Slit [bangus] in the back. Clean. Marinate overnight. The bangus is then pan-fried after marinating. 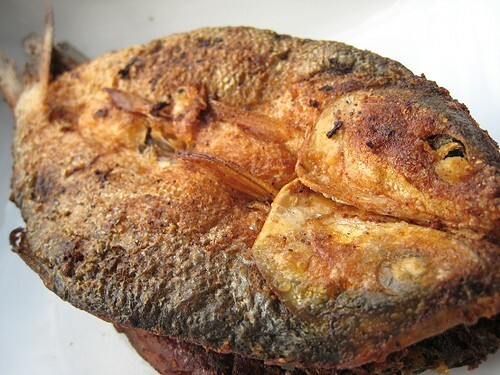 We've always had bangus in this form: that is, split and butterflied like this. 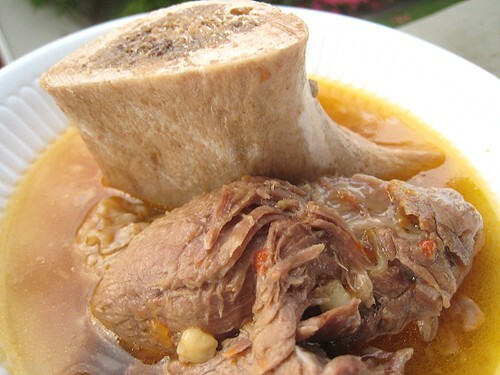 Bulalo actually refers to the marrow bones, but we've kind of extended the word to include soup made with beef bones, with or without marrow. It's tougher to find marrow bones nowadays as they're not always available. We more or less "wing it" each time we make bulalo and we've settled into a bulalo that we like. We usually blanch the beef bones first. Bring water to a boil and dump the bones into the pot. Start with cold water and put the blanched bones into this pot. Add ginger and the onions. We don't really season yet at this point as we just want to extract the flavour from the bones. Bring to a gentle boil, skimming scum off the surface. If the bones have been blanched enough as the first step, you'll be saving yourself a lot of work this step. The bones would be fairly "clean." After an hour and a half, you can add beef pieces to the pot. We usually blanch the meat as well, just to get rid of the impurities. The cut of beef we use is the shin. All timing is approximate here. This is really another just dump everything into a pot and wait for it to cook type of dish. You can, for example, just add the beef pieces in the beginning as well. We just like to extract some of the flavour from the bones first before adding the beef pieces. If you have a mother who likes to skim stuff off the surface, then you're in luck. During waiting times like these, our mother would usually come in and out of the kitchen to skim the fat from the broth as a labour of love. An hour before serving, you can add the vegetables so they retain their form and not disintegrate into the soup as much. We usually add a couple of tomatoes and some potatoes. Cabbage is the other vegetable we add, although I think we'll be doing in with a green leafy like bok choy next time to have that "green" taste in the soup. The cabbage usually adds a lot of sweetness to the finished soup. Here is LSC's recipe for bulalo, if you like a recipe for this. We used to add a lot more onions to our bulalo but we've decided to dispense with the onions because it adds too much sweetness to the soup. If you prefer more sweetness, you can also add chunks of carrots. We don't add carrots, because, as I said, we don't like the soup to be too, too sweet. Bulalo is a hearty one-pot meal. Terribly easy to do, but it does take some planning as it does take a while to cook. That means you can't start it at 4:30 in the afternoon hoping to have it on the table by 6:30 in time for dinner. Do you know a fish I could substitute for milkfish? This looks so tasty, but I've never seen milkfish in soCal. That's a really good question. It has never occured to me what would be a good substitute for milkfish. Thinking about it now, milkfish has firm, white flesh that is quite tight. In that regard, it isn't like tilapia. Nor like cod, which tends to be flakey. Halibut seems to be closer in texture, but milkfish still is more delicate than halibut in terms of texture and flavour. Hm, this is a hard question. The great thing about milkfish is really the interplay of the skin to flesh, so halibut is then out of the question. Milkfish is a freshwater fish and trout would be closer in terms of the texture (trout cooked longer, especially) and the skin-to-flesh ratio would be more similar. The only thing of course is trout is an orange-fleshed fish. Orange-fleshed, but rainbow trout can also be very delicate. So, in conclusion, perhaps rainbow trout would be closer to milkfish. Rainbow trout is my final answer. I've seen milkfish sold in some of the Asian supermarkets down in LA, so the best bet is to head down to a Ranch 99 market. There are whole milkfish that are frozen, in freezer cases or thawed out for display. Also, there are milkfish already split and marinated in these same markets or in Filipino markets. Best of luck in finding milkfish. 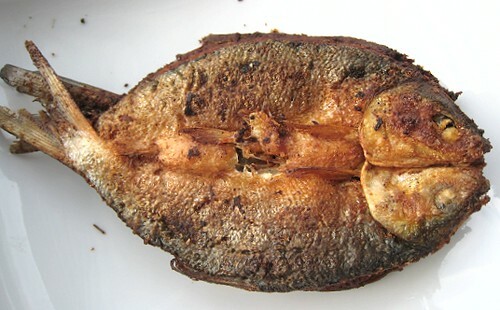 Bangus is delicious though and it's one of these fishes we can eat everyday. Wow, thanks for all the info! There's a 99 Ranch about 30 minutes from me, I'll have to check there. I have used saba or mackarel fish in this fried fish dish and it tasted good too. Actually it works pretty good because mackarel has that firm flesh minus the small bones of the milkfish. I have a sudden craving for bulalo. Saba is delicious and would work with the same marinade. Overcooking is a constant problem in our house. With fish, I myself am a touch squeamish seeing undercooked fish flesh. Sashimi is fine, but those things have been flash frozen to -20 to kill off parasites, but freshly-caught, which I assume most rainbow trout is, is another story. Sometimes, I do believe that overcooking trout just slightly actually leads to a boost in flavour of said fish. Absolutely love the idea of both of these recipes. I wanted to be able to reach through the screen and grab that beautiful marrow bone. my hand still hurts from trying. Your bangus looks so darned good. Crispy! 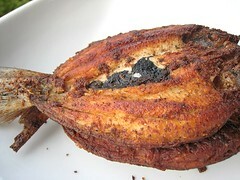 I have never heard of milkfish but just from looking at the picture I really really want it it looks extremely good. 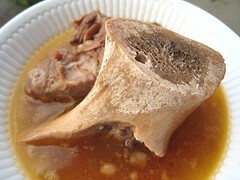 The beef bone soup sounds really good too, meat bones tend to have that rich delicious flavor that I can't live without. I've never heard of milkfish. Sounds nice though.